Some pictures of the decoration and landscape-building. The wall of rocks. I have used cork as the main building material, which -apart from being very beautiful, is too hard to work with. I wont be using this material again ever. But I must admit that it looks like real rock to me. Where there is no cork, I use alu-net with plaster. That is a method I WILL be using the next time I have to make landscape. Idoia planting the first pieces of vegetation. The grass is pieces cut from a paper roll of grass. While the grass itself looks pretty good, this method isnt recomendable either. The next time I will be using a "Beflockungsgeräht". Either a homemade 3100V unit, or simply a plastic bottle to build up the static electricity field. The picture shows also a 1:1 human (my wife, Idoia) doing some planting of vegetation. The model in the model. A better view of the eh... landscape. The regular TEE leaves the tunnel on the paradestrecke. Again I feel I must apologize for the missing weathering of the walls and stones. The flash of the camera makes it even worse! 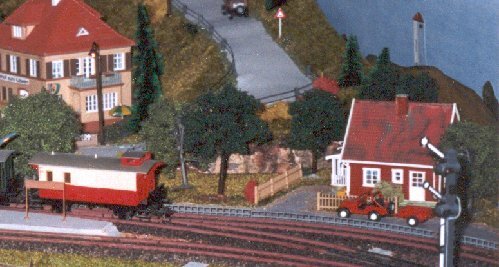 A local passenger train on the paradestrecke. 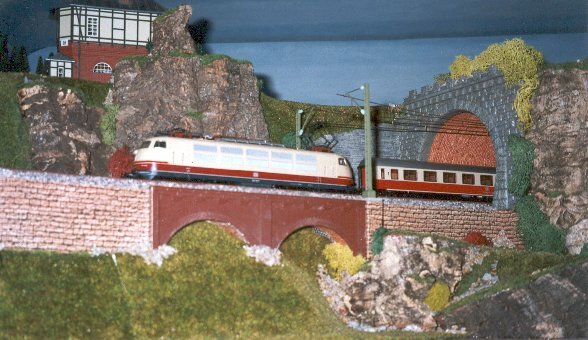 A BR212 with 4 4-axeled umbauwaggons. One of my favorite trains, because there are so many locomotives you can use for these waggons, without being "un-prototipical". I have a small video-clip available showing a BR50 with mixed freight cars, crossing with a E103 pulling a classic TEE consist on the "paradestrecke". 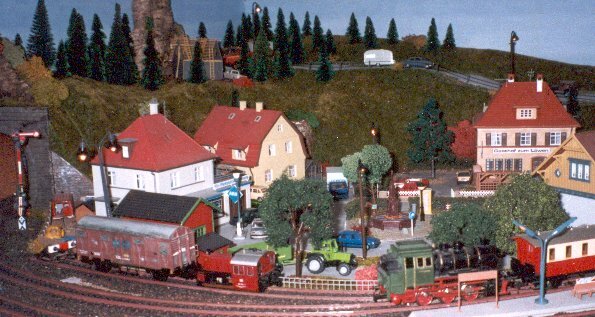 The landscape showing here is almost finished, with quite a mixed vegetation, but still missing trees and weathering though. File is in RealPlayer format! An overview of the small town. The almost finished small town. The mountains to the left still needs finishing, and some more trees are also needed. But other than that, the town is finished, and already with a lot of details. Oh! The PREISSERS are still missing. I have them by the hundreds, but still need to paint them first! A closer view of the housing. A closer look of the town "Predaz". A lot of things are going on here! 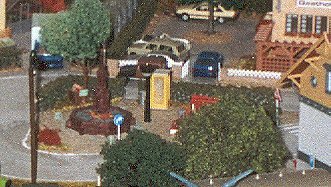 A house being constructed on the hill, a park, a petrol-station with a scrap-yard, a goods shed, a gärtnerei, a small inn with an iluminated sign and a party-decorated terrasse with coloured lights. Anyway... I dont pretend that this town is a big triumph of my ability to decorate a layout. I am painfully aware of many of the errors comitted. Again weathing and colouring are the two worst offenders. But also the golden rule of "less is more" is grossly offended. The hill behind the houses lacks terribly in detail. I guess the use of grass-mats is really a no-no! A small house to the right of the station. The small wodden house to the right of the station could be imagined as being the home of the local veteran train group. The house is one of few surviving Heljan buildings from my childhood. The road in the hill is made with plaster and a spatula. The scrap yard behind the petrol station. A closer view of the small park. A closer look at the park in the center of the small town. This park is pretty well maintained and equipped, for such a small town where not even the local passenger trains stop anymore. Maybe the caretaking of the park is done buy the local gardener to the left, and/or paid by the Gasthof to the right? -Or is it just another model-builder failing to abide by the rule that "Less is more"? A look to the inn from the tracks. At the end, a last look through the park, to the Gasthof from the track area.